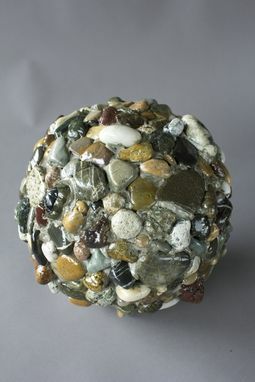 "Around" is a welded 16 gauge steel abstract sculpture including ocean rock collected from many parts of the world. Many pieces of 16 gauge steel were cut with a CNC and welded. The ocean rock was then adhered to the piece grouted and finished with a clear coat. 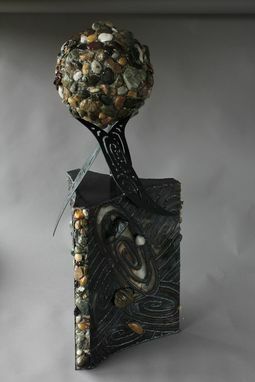 The piece stands approximately 3 ft. tall and 1 ft. in width. This is the first sculpture I made. It holds a lot of sentimental value for me because of the ocean stones included in the piece. I collected every stone myself during many travels since I was young. Up close the detail of the rock is amazing and inspiring, the clear coat really brings out the detail in every individual stone as if it were under water. Of course this piece was gifted to my mother but I am willing to create something similar if anyone is interested. The cost would depend on the size of the piece and material used.